On the road to Nhill | Where to next? I never expected to end up on the road to Nhill, but that’s the town we rolled into not long after dodging countless mobs of kangaroos in the Grampians. This Victorian hamlet shot to national fame in the late 1990s with the release of the comedy film, Road to Nhill. It’s a quirky story about a group of women who are in a car accident after playing lawn bowls. I remember that it had some good laughs, so I might just have to watch it again when we get home. 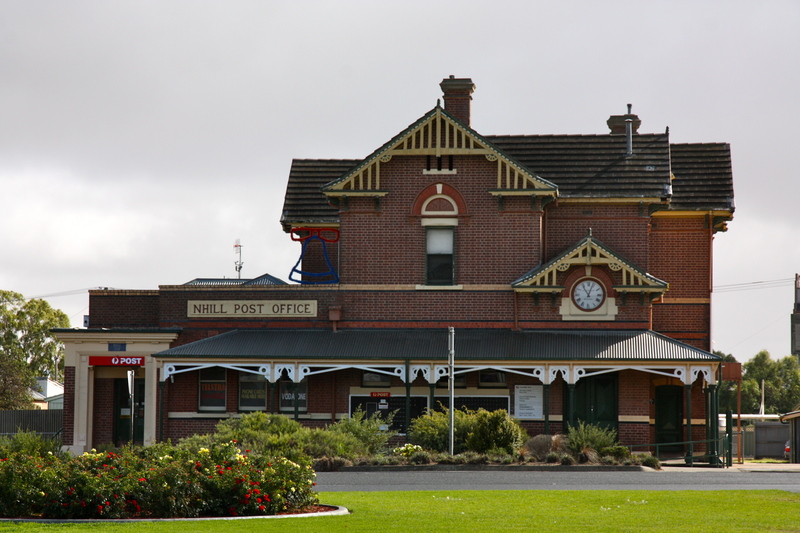 Nhill, which is an Aboriginal word meaning ‘early morning mist rising over water’, is well-kept. Main street has some buildings that have been done-up in the Federation style. Plus, there’s the rather grand old post office that opened in 1881. The transport industry considers this small town to be the mid-way point between Melbourne and Adelaide and, as such, is where driver changeovers are made. Now I know where the supermarket Luv-a-Ducks come from! Nhill is the company’s administration headquarters. Maybe I’ll buy a frozen duck on the way back to Canberra. On this day, we stopped in the bakery and bought bread for lunch.